If you enjoy cocktail with vibrant colors, then you will love the Incredible Hulk cocktail. It has a vibrant green color reminiscent of the skin of its namesake. To obtain its vivid green color, the Incredible Hulk cocktail uses a tropical fruit liquor called Hpnotiq® in combination with cognac. Hpnotiq has a pale blue color and contains a proprietary blend of tropical fruit juices, cognac, and vodka. When the cognac is poured into the Hpnotiq, the drink turns green. The drink was invented at Sean Comb's restaurant, Justin's, in New York City. Fill a lowball glass with ice and add cognac. Pour Hpnotiq over ice, and the color will transform to green. Shake the ingredients with ice in a cocktail shaker and serve martini style. Create an Incredible Hulk shot by mixing 1/2 ounce each of Hpnotiq and cognac in a shot glass. 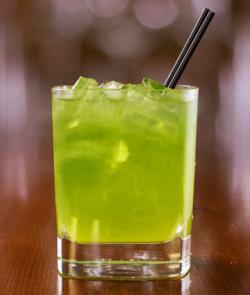 Supercharge your Incredible Hulk by adding 1 ounce of white rum to the drink. With its vibrant green color and tropical fruit flavors, the Incredible Hulk makes a fun summer drink to serve at your next party.